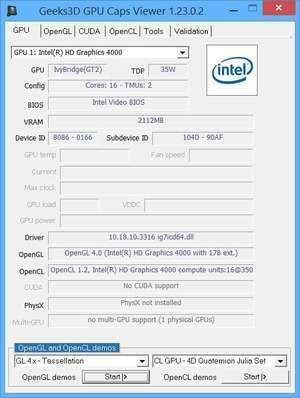 GPU Caps Viewer Portable is an easy-to-use program which provides details about your graphics adapter configuration along with OpenGL details. It also provides hardware-specific information about the CPU and GPU like clock speeds, temperature climb and stability. As a portable application, installation is not required. GPU Gaps Viewer Portable can be run from virtually anywhere and it should not leave any traces or entries left behind in the Windows Registry. For security reasons, you should also check out the GPU Caps Viewer Portable download at LO4D.com which includes virus and malware tests. Additional screenshots of this application download may be available, too.